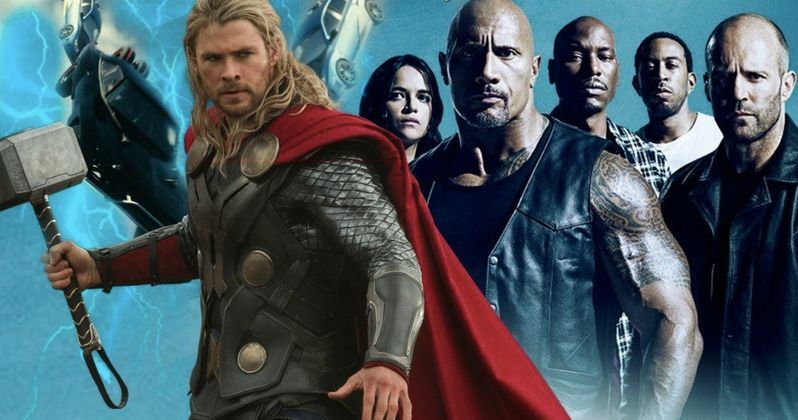 Ever wondered who would win in a fight between Thor and Hobbs from the Fast and Furious movies? Dwayne Johnson wants to see that question answered on the big screen, as he's called for just such a crossover movie to take place. Could this actually happen? Almost definitely not. Would there be a lot of people who would pay to see Thor throw down with The Rock in a big-budget action movie? No question. This whole thing came up on a recent episode of Dwayne Johnson's new competition series The Titan Games, which features contestants taking on various strength and endurance challenges. During a segment, Johnson was seen holding a huge hammer and that got him thinking about his friend Chris Hemsworth, who plays Thor in the Marvel Cinematic Universe. That prompted the wrestler-turned-actor to say the following. "I know why my buddy Chris Hemsworth likes putting on that Thor costume. I mean, there's real power in wielding a hammer like this. I got an idea, guys: how about we make a Thor and Fast & Furious movie, you guys want to do that? Where the God of Thunder, Thor himself, he comes flying in and then wham! He gets stopped by the real God of Thunder. Box office gold, hashtag #ThorHitsTheFloor. You're welcome, Chris. He's gonna text me later." Let's, just for fun, assume that Dwayne Johnson is even remotely serious about making this happen. What would that logistically look like? For one, both he and Chris Hemsworth are insanely busy. So just from a scheduling standpoint, it would be nuts. But then there's the fact that the Fast and Furious franchise is owned by Universal, whereas Thor and the rest of his Marvel buddies are owned by Disney. There is virtually no universe in which the studios agree to let such a thing happen. (Well, Disney and Universal did recently come together to let M. Night Shyamalan make the superhero sequel Glass using characters from both studios. And Sony did eventually let Marvel play with Spaide-Man). That said, in a tweet, Johnson did say that he would reach out to Marvel Studios president Kevin Feige about it. "Hey I specialize in big, crazy ideas for the world to enjoy..& a movie where it's the God of Thunder Chris Hemsworth vs that big, brown, bald, tattooed, tequila drinker fella. U guys ready to see that? #ThorHitsTheFloor #BoxOfficeGold I'm calling Kevin Feige to make this happen." Even though this probably won't ever happen, there is no reason that The Rock and Chris Hemsworth couldn't work together on a big action movie outside of these franchises in the future. Or why not just let Hemsworth get in on the Fast and Furious fun in a future installment? In the realm of reality, Hemsworth can be seen as the God of Thunder in Avengers: Endgame on April 26. As for Dwayne Johnson? He'll be back as Hobbs in Fast & Furious Presents: Hobbs & Shaw on August 2. Feel free to check out the clip in question from The Titan Games from Dwayne Johnson's Twitter account below.